In a recent report, the International Labour Organisation in Geneva considers that the EPO suffers from “a governance problem of broader dimensions” and expresses concern that the number of staff complaints being filed by EPO staff with the Administrative Tribunal of the ILO “represent a challenge to its effective functioning”. The Governing Body plans to request the Director-General of the ILO “to initiate without delay discussions with the European Patent Organization (EPO), in consultation with the Tribunal as required, in order to identify a solution to the difficulties caused by the number of complaints generated within the EPO and which threaten the ability of the Tribunal to serve all other member organizations, and to report to the Governing Body at its next session”. 10. The largest member organization, employing approximately 8,800 staff, accepted the Tribunal’s jurisdiction in 1978. The EPO’s membership has always been marked by significant level of litigation. EPO-related complaints have generated, on average, 21 judgments per year, the lowest number being ten judgments in 1998 and the highest being 69 judgments in 2015. In its 37 years of Tribunal membership, the EPO has been concerned by 761 judgments out of a total of 3,560 judgments delivered by the Tribunal since its creation. 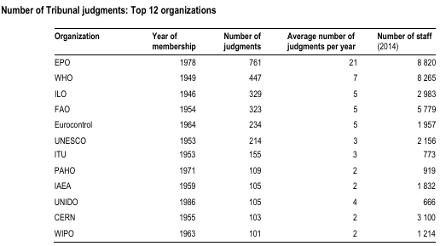 By way of comparison, the Tribunal’s second oldest member organization – the World Health Organization – with similar staff numbers has been concerned by 447 judgments in 66 years of membership, that is an average of seven judgments per year (see the table below). In the last five years, whereas the EPO’s staff represents less than 16 per cent of all officials covered by the Tribunal’s jurisdiction, the number of cases filed annually against the EPO represented on average more than 30 per cent of all the cases received by the Tribunal, with peaks above 40 per cent of the overall annual Tribunal workload. This persisting pattern stretches the Tribunal’s resources and inevitably impacts on the processing time of complaints, including those filed against all other international organizations that have recognized its jurisdiction. 11. Despite the written exchanges between the ILO Director-General and the President of the EPO on this matter, and the measures taken internally by the EPO in recent years with a view to improve its internal remedies and reduce litigation, no progress has been registered so far to contain the number of labour disputes which give rise to cases referred to the Tribunal. In this regard, it should be noted that out of the 193 cases filed with the Tribunal from 1 January to 18 September 2015, 112 (or 56 per cent) originated from EPO officials, while the remaining 81 complaints were filed by officials of 23 different international organizations. In addition, following important reforms introduced in the EPO in the past two years, the number of internal individual grievances has grown exponentially, a situation that may reasonably be expected to give rise to an even larger number of EPO-related complaints with the Tribunal in the very near future. 12. In order to present a balanced overview of the underlying reasons for the increase in the Tribunal’s caseload, the Office undertook broad consultations with the principal stakeholders, including the judges of the Tribunal as well as the administration and staff representatives of organizations having accepted the Tribunal’s jurisdiction. 13. According to the written reply provided by the Tribunal, the increase in the number of organizations is not a problem in itself as statistical data show that the organizations which recognized the Tribunal’s competence in the last ten years did not significantly increase the Tribunal’s workload4. It is the number of complaints filed against a single organization, the EPO, rather than the rise in the overall number of organizations having accepted its jurisdiction, that represents the main challenge for its effective functioning. The Tribunal further considers that all its efforts are being compromised by the continuing increasing trend of EPO-generated cases and also indicates that the complexity of the problem may require the attention of the Governing Body. 14. The Tribunal has made it clear that it has reached its limits in terms of output and that it could not be expected to increase it any further without compromising the quality of its services. This is probably also connected with the fact that the judges do no work for the Tribunal on a full-time basis, but usually sit only twice a year for three to four weeks each time, and that some of them have extremely busy schedules as they are still serving in the supreme courts of their respective countries. 15. The Tribunal also drew attention to the fact that administrative tribunals of much narrower coverage – geographical or other – have gradually come into existence which raises legitimate questions as to whether it can still be considered to be the “natural judge” to hear complaints against organizations operating, for instance, within the administrative framework of the Council of Europe or the European Union. While there is nothing in the Tribunal’s Statute to restrict admission on the basis of an organization’s coverage, it should be remembered that the original intention was to open up the Tribunal’s jurisdiction to truly global organizations which would be otherwise deprived from access to any international administrative jurisdiction. 16. Finally, the great diversity of staff rules of organizations under the Tribunal’s jurisdiction, the lack of internal means of redress in some organizations, the frequent challenges to normative acts of general application, especially by staff representatives, and the lack of employment stability of the Registry staff, were also identified as additional factors contributing to the Tribunal’s increasing caseload. 17. Based on written replies provided by seven organizations and the views expressed by representatives of 29 organizations during a one-day consultation meeting, it is generally recognized that the admission of small international organizations in recent years is neither at the origin of the rising backlog of the Tribunal nor likely to impact on the Tribunal’s caseload in any significant manner in the near future. However, the resulting diversity of legal frameworks governing employment relations of staff under the Tribunal’s jurisdiction may occasionally generate delays. 18. Member organizations expressed serious concern about the volume of complaints against the EPO, and most importantly about the fact that problems around the “litigation culture” and social dialogue in that organization are not conjunctural but are most likely to persist unabated for many years. The general sense is that, based on available information, the current situation is not sustainable and that measures such as the increase of the number of judges or the number of sessions will not have a lasting effect on, much less resolve, the current flow of complaints filed by EPO officials. While noting the explanations of EPO administration officials about their genuine efforts to improve the situation, member organizations agreed that this was a governance problem of broader dimensions which called for urgent action in the interest of preserving the Tribunal’s operation. 4 According to these data, 15 organizations have recognized the competence of the Tribunal since 2005 and have generated 65 complaints out of a total of 1,863 complaints; among those organizations, six have not so far been the object of any complaint, four organizations have each generated one complaint, and one organization has been the object of two. Put briefly and in very simple terms, the International Labour Organisation recognises that there is something uniquely rogue in the EPO that causes a massive number of complaints to come from workers. There are so many complaints in fact that the International Labour Organisation finds itself drowning in them. The real issue here seems to be the EPO’s governance (or administration, or management). They make recommendations accordingly. 24. On the basis of the information presented in Part I above, and following the broad consultations undertaken by the Office of the Legal Adviser over the past three months, three main conclusions seem to emerge: firstly, it is difficult to see how the Tribunal could continue under its current configuration and arrangements to cope with both its accumulated backlog and increasing workload. Secondly, the recognition of the Tribunal’s jurisdiction by new international organizations does not affect in any significant manner the capacity of the Tribunal even though the diversity of legal rules and regulations may at times prove challenging. 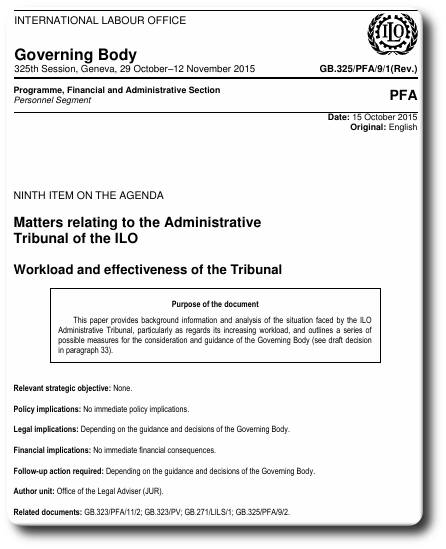 Thirdly, the introduction of further changes to those undertaken by the Tribunal to increase its capacity to deal effectively with the workload may well result in efficiency gains in specific areas of the Tribunal’s functioning but will not be sufficient for the Tribunal to cope with the growing volume of complaints filed against one single organization (the EPO). 25. Faced with such reality, the Office could explore three strands of action in order to find long-lasting solutions to address the current situation. Firstly, an urgent, practicable and time-bound solution needs to be found regarding the facilitation of the speedy adjudication of all EPO complaints in a manner that permits the Tribunal to fulfil its mandate and effectively serve all other organizations, which have recognized its jurisdiction.